The short circuit between creativity and technology as an example of the Italian excellence. 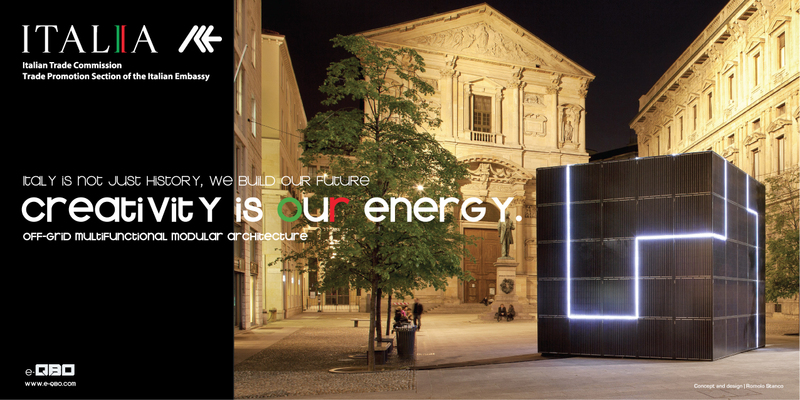 e- QBO is a multifunctional temporary off-grid architecture. An object of pure and essential form with a great aesthetic and functional impact designed by architect Romolo Stanco and developed by innovative start-up T°RED to meet the needs of the cities of the future. e- QBO was selected by ICE – Italian Trade Commission to represent Italy at the World Future Energy Summit in Abu Dhabi along with GSE – Gestore Servizi Energetici and RSE – Ricerca sul Sistema Energetico and a group of top Italian companies: e-QBO is the ultimate symbol of the activities and proposals thought for the future smart cities. Italian creativity and talent come together in a tangible and sustainable project that best represents the excellence of our country: architecture, design and research, showing how energy and creativity made in Italy can throw together the roots of the future. e-QBO is able to store energy due to its photovoltaic “skin” and return it in the form of services for private and public uses: power of each internal service that requires electricity, street lighting, audio and video communication, interactive acquisition and restitution data, free wi-fi and free energy available for charging electronic devices and electric vehicles. A real “smart” off-grid architecture ready for any use. e-QBO is a ‘flagship’ of the research on the topics of new energy self-sufficient urban objects that integrate different functions, a manifesto of a virtuous way to combine creativity and experimental research, made possible by the synchronous collaboration of institutional and corporate organizations, public and privately held, that have seen in Stanco’s intuition the way to meet the challenge of the future. The participation at WFES is the result of the work of an innovative territory, the demonstration that a shrewd work of sowing allows to develop initiatives that projected in the international arena offer a hope for a revival of our economy. e-QBO is not only an intuition, is the son of a territory and of an industrial system that knows how to make itself available for developing new ideas and taking the necessary risks. e-QBO is therefore also a paradigmatic story of the ability of Italian companies to talk not only along the traditional vertical supply chains but by breaking down barriers to foster horizontal collaboration. e-QBO has received the Patronage from Regione Lombardia and from Comune di Piacenza. Discover it live at WFES 2014 and discover the companies that made it possible for e-QBO to be here and working.